We have been able to provide the customers with a commendable assortment of Blind Flange. which is sourced from the certified vendors of the market. Further, the entire range is thoroughly tested on varied parameters to ensure dimensional accuracy, flawlessness and zero-defect. We are business organizations engaged in manufacturing, supplying and exporting a formidable assortment of Blind Flange. Our range is made using high grade raw material. Available in varied sizes & shapes. 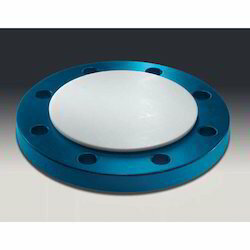 Owing to our expertise in this domain, we have been able to provide the customers with an excellently built assortment of PTFE Lined Blind Flanges. Precisely designed by the expert professionals, the range is easily used in extensive industrial applications.